If the US & Allies get away to ruin yet another nation, it is time the Members of the UN take a firm stand to exit the UN, for there is little use in a world body that by virtue of its Charter exists to prevent wars & maintain peace, when obviously it cannot do so. What has this world body done about US invasion of over 22 countries in 20 years? UN could not stop close to a million dying in Iraq from sanctions Close to 3000 US citizens died & the entire world is supposed to weep for them but nothing is shed for the close to 40,000 Afghan soldiers, 34000 Afghan civilians, close to 70000 Iraqi soldiers, over 107,000 Iraqi civilians killed when US & Allies invaded & bombed them though all of the 9/11 hijackers were not Iraqi or Afghans. UN Member states have watched continent after continent, country after country being illegally invaded by US & its Allies, these countries have lied, have paid media to lie, have paid human rights organizations to lie, have paid even academics & civil society to lie. UN has become a podium where bogus Acts, Declarations & Resolutions have been passed specifically to invade & destroy nations & people. This must stop. 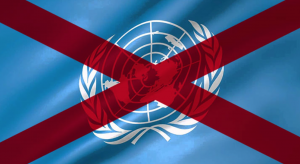 UN Member states must take a stand NOW or the citizens of these countries must demand that their countries exit the UN. According to the Institute for Economics & Peace close to 14,000 terrorist attacks have taken place in 93 countries in 2014 with close to 33,000 civilian casualties. The United States military has spent more than $5.6 trillion on conflicts since 2001 which is costing the US taxpayer $23,386 and what are they getting out of bombing countries many of them don’t even know where they are on the world map? Why should the average American care if Gaddafi or Saddam, Assad or any other foreign leader for that matter is oppressing his people? Americans should worry only if anyone was attacking their country & none of the countries that US invaded have threatened the US! Ironically, only 24 Americans have died in the last decade from some form of terror attack yet over 280,000 Americans have died from gun violence! America’s illegal invasions have caused the death of 6,251 U.S. troops since 2001, 45,170 U.S. troops have been wounded in war since 2001. The Rand Corporation has estimated that approximately 320,000 service members may have experienced traumatic brain injury during their deployment – that’s almost every personnel deployed. Every day an average 18 veterans die from suicide – why? is it the drugs they are forced to take or the guilt of orders carried out? The US has admitted to carrying out at least 42 false flag events all of which have led to complete chaos & draconian laws that have affected the freedoms & liberties of peace. US is accusing other countries of aggression when the US has over 1000 military bases with close to 400,000 military personnel deployed in 120 countries. Tthere are over 20,000 troops stationed in Korea and not a single North Korean troop in US, when US has killed over 3m Koreans on Korean soil while no American has been killed by a North Korean on American soil. US accuses Iran of aggression but has anyone taken a look at the military bases of US? Iraq has been a victim of US since 1991 – 2003, first with Operation Desert Storm supposedly to liberate Kurds and sanctions that led to a million children deaths. Kuwait (1992), 1998 US & UK troops conducted a 4 day bombing campaign. How can the UN promote sovereignty or freedoms when these global conquests are all about controlling the world economy, its financial markets & taking over the natural resources & handing over to a handful of private individuals? Less than $30billion per year is needed to end hunger by 2030. However, the world spends $1600billion per year on wars – US spends $737billion per year on military! A study by Georgetown University claims Christianity is worth $1.2trillion in the US alone & if taxed the revenue would be much more than the required $30billion! $11.7billion was spent on political ads in 2016. US accounts for 5% of the global population but houses 25% of world’s prisoners. 1 in 13 African Americans are cannot vote as ex-felons are denied right to vote. 1 in 15 black men are behind bars. US taxpayers pay $69b annually to maintain US prison system. (Prison index) It costs 4 times more to maintain a person per year in jail than to send a child to school. What has the UN done to protect its Members from the aggression of US & Allies? Clearly the UN is a body of biased judgements & resolutions that lead to interference in the internal affairs of sovereign nations & UN bodies & agencies are tasked to facilitate these incursions & invasions. Non US-Allies must now take a firm stand – how many countries has the US-Coalition destroyed? What is the independence Kosovo enjoys better than they did under Milosevic? How has Sudan prospered? What is the liberty & freedom that the Iraqis & Libyans have got after killing their ‘dictators’ and all these invasions took place with UN knowledge & UN awareness & even with UN’s nod of approval or silence. We cannot watch another country fall into peril being bombed and destroyed – Libya was a beautiful country – look what it looks like now. Yugoslavia was a beautiful country but bombed, Syria was a beautiful country and is now the stage of more bombing campaigns and these countries all are part of an ancient historical heritage which has to be protected and these sites have historical value. None of us want to see these ancient sites ruined by a bunch of sadistic individuals who are nicely seated in a/c rooms ordering people to be shot down, bombed, killed or assassinated. If the UN cannot do anything to honor the Charter that justifies its existence, then the UN must be shut down and Russia & China must lead the exit of the UN by all Third World Countries all of whom are neocolonial victims of Western hegemonic aggression. US is threatening to exit the UN – the Russians, Chinese & Rest of the world should do so first. Shenally I had begun writing an article on the same subject. I could not finish it as there were other events taking place and shelved writing it. I will complete it soon and post it. Striking facts but sadly, no one can do anything about it! Charles and Shenali I think we are writing for deaf and blind guys if not why no one is standing straight like a iron bar and oppose these barbarism by America and the west? Why no country stand and oppose their unfair actions? Peace loving countries around the world should stand firmly and say enough is enough to theses western hypocrites. Killing human beings like animals is a sport for theses bastards. They care damn about human Life. They are born to kill innocent people. History will tell you how many innocent lives they have destroyed unnecessarily and now many historical countries they have destroyed? Separate hell needed for theses western blood thirsty terrorists countries. I hope Putin will give them a good answer if they attacked Syria this time. Yes Ranjit it is like throwing a bottle with a message inside into the see, hoping some day some one picks it up and read the message. But Shenali writes researched articles and there is a good chance that her articles be picked up by News Papers and political researchers. But I write because I find it difficult to keep these feelings which burn my inside and I have to find an outlet. Russian jets having fun over BEST US DESTROYER Donald Duck (COOK)! This was in 2016. Dear editor can you publish this beautiful video. I agree what has the bloody UN done to stop the NATO nations surrounding Russia with military bases and forces for the last 15 years. Russians are quite rightly angry and fed up. Russian leader Putin has been remarkably restrained calling for peaceful negotiations with NATO countries. But criminal NATO countries especially US, UK, France and Isreal never sat down to talk they are determined to attack other sovereign countries and start wars. The leaders of NATO countries and Isreal are absolutely criminal. They must be stopped. This entry was posted on Thursday, April 12th, 2018. You can follow any responses to this entry through the RSS 2.0 feed. You can skip to the end and leave a response.